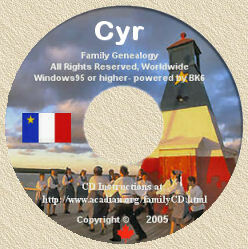 Acadian Genealogy Homepage; The Pierre Cyr Family - L'Histoire de Pierre SIRE! Click here to View Great CYR Product/Gift Ideas! Pierre SIRE was born in 1644, possibly in Bourgueil, Touraine, France. This is a statement which is often quoted when writing the story of Pierre Sire. We do not know the origin of Pierre Sire's parents and, in fact, early DNA results suggest Pierre may in fact have Flemish roots. Flemish is the territorial name for the Dutch language spoken in historic Flanders, a region mostly comprising the northern part of Belgium, but also including a southern part of the Netherlands and a small area of northern France. He arrived at Port Port Royal, Acadia on the ship "Espérance en Dieu" [Hope in God] in 1668. Early historians indicate that he was a gunsmith however, there is also some questions as to Pierre's actual occupation. In 1670 (possibly April 10) at about 26 years of age, he married Marie Bourgeois, age 17. She was the daughter of Jacques Bourgeois (c. 1619 - 1701) and Jeanne Trahan. Jacques was a military surgeon serving under Charles Menou d'Aulnay, the military governor of Acadia. "Jacques Bourgeois, one of the most prosperous inhabitants of Port Royal, began developing a new colony around 1672 on one of the extensions of Baie Française [Nay of Fundy] known today as Cumberland Basin, which the Indians called Chignectou. "He arrived in Acadia as a surgeon in 1640 under d'Aulnay's regime and handled coastal shipping and trading with the Indians in Baie Française. He was 53 years old in 1672. "The first settlers in Beaubassin around 1672 were Jacques Bourgeois, his sons Charles and German; his 'mariner pilot' Pierre Arsenault (Arceneaux); Jacques Belou; Jean Boudrot; Thomas Cormier; Germain Girouard and Pierre Sire. Jacques Bourgeois' father, also named Jacques, was an army officer at Port Royal. In 1654, when Sedgwick seized Port Royal, the senior Jacques Bourgeois returned to France, but his son remained in Acadia. Jeanne Trahan, born in 1629, was about six years old when she came to the New World with her parents. Various credible history sources [including Stephen A. White Dictionaires, p. 1536; 1], mention Guillaume Trahan, as Jeanne's father. "The admiralty of La Rochelle are the first to show French families coming to Acadia. They came aboard the 'Saint-Jehan' on April 1, 1636 along with hired men recruited from Champagne, Anjou, La Rochelle and Brittany. Three names from this group turned up in the 1671 census. "In April 1636, the ship 'Saint-Jehan' left La Rochelle and seventy-eight emigrants from La Rochelle, Paris, Dijon and villages named Bourgueil and Chinon in the Loire Valley. Among them were five saltmakers, three sailors, a woodchopper, a toolsmith, a cooper, four tailors, a shoemaker, a vinegrower, a miller, a gardener, a gunsmith (Pierre Sire?) and nineteen farmers. Seven men brought their wives, six brought children. "Guillaume Trahan (1601 - 1682) married Francoise Corbineau on July 13, 1627 at St. Etienne Parish in Chinon, near Bourgueil, in the province of Anjou. 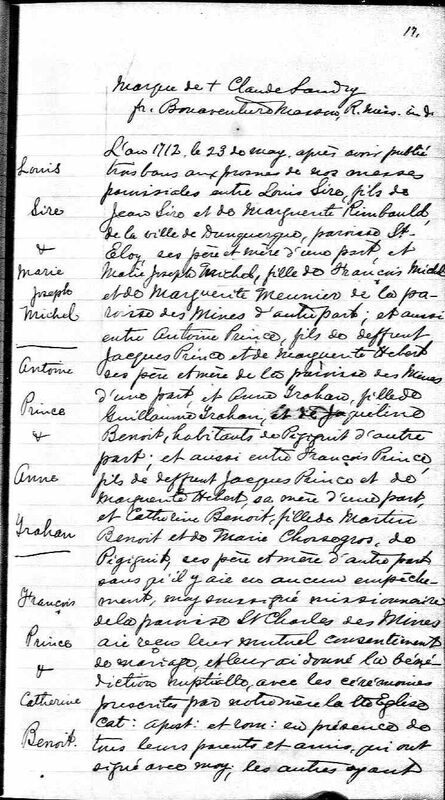 Guillaume was the son of Nicolas Trahan and Renee Desloges, according to the marriage record at St. Etienne which mentions no parents for Francoise. Guillaume had served an apprenticeship in the metal trade and he and his brother moved to Bourgueil, about 1630. Guillaume and Francoise had two daughters. "On April 1, 1636 the family sailed out of La Rochelle on the 'Saint-Jehan' and landed at La Heve in Acadia. The passenger list read: 'Guillaume Trahan, a toolsmith, with his wife and two children and a valet, all from Bourgueil.' This was the last entry on the roll of peasants of Anjou who boarded the ship 'Saint-Jehan' to work in New France. One of the daughters, Jeanne, would become the mother-in-law of Pierre Sire. Having attained the highest rank in his trade, Guillaume was accompanied by a journeyman (valet). Now we return to Pierre Sire and Marie Bourgeois. They had three children; Jean [Jehan] born about August 1671; Pierre, about 1677; and Guillaume born about 1679. Pierre died in 1679 so he left his twenty-six year old wife with three young children ages 8, 2 and newborn. He was buried in Beaubassin On June 9, 1680 Marie married Germain Girouard, one of the men who settled in Beaubassin with the original group, in 1672. She died in Beaubassin on March 2, 1741 at the age of 88 years. The question of why the surname was spelled "Sire or Sirre" is addressed in the "History of Madawaska" as being "antique orthography" or ancient spelling. [See copy of Pierre Sirre's signature, below]. Some cleck or Priest may have written it as it sounds, since in the French language "Sire/Sirre" and "Cyr" sound the same. The surname "Sire was only kept for two generations and, by the time Pierre Sire's grandson was born, the name had become "Cyr". Jean [Jehan] Sire, who was born in Port Royal probably in the month of August 1671, married Francoise Melanson (1683 - June 12, 1720), in 1698. 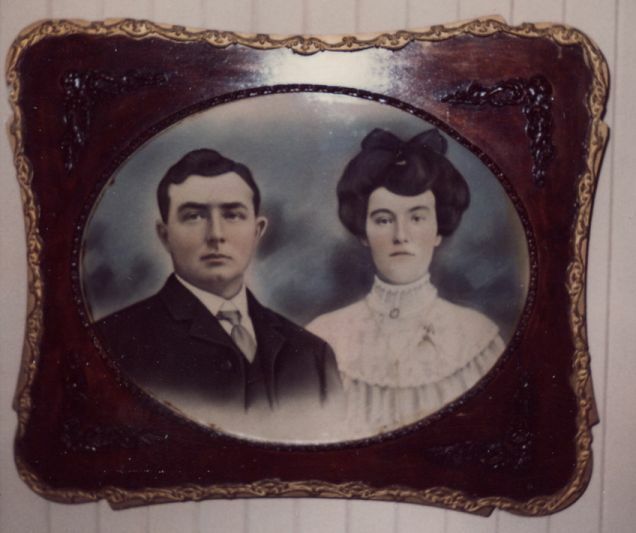 They married in Port Royal but lived in Beaubassin. She was the daughter of Charles Melanson and Marie Dugas. It is believed that Charles Melanson came from Scotland and his family may have been Protestant Huguenots of French origin. While the rest of his family emigrated to Boston, he and his brother, Pierre, remained in Acadia, married French girls and became Catholics. Jean and Francoise had eight children, among them Jean-Baptiste [Dit Croc] who was born about 1710. Colonel Church and his troops came back to Beaubassin in 1704. They burnt about 20 houses and killed all the livestock, but the Acadians fought back and he was forced to withdraw. (8) Acadia fell to the British for the final time in 1710 and after the Treaty of Ultrecht in 1713, was renamed Nova Scotia. Jean-Baptiste grew up during a period of vacillation by the British as to what to do with their Acadian subjects. On the one hand they would have like to get rid of them and replace them with British settlers, but their attempts to do this had met with little success. The British emigrants preferred to settle in the American colonies. On the other hand, they needed them to provide foodstuffs, lumber, and labour for their garrisons. They also did not want them reinforcing the nearby French colonies. 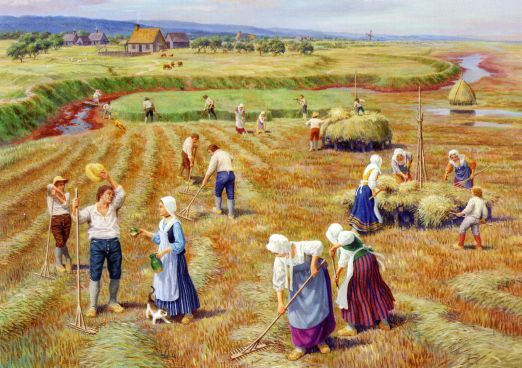 The Acadians had reclaimed marshland along the bay, by building dikes [aboiteaux] and sluices which resulted in lush, fertile fields for growing crops and grazing livestock, hence the name for their settlements... Grand Pré [Large Meadow] and Beaubassin [Beautiful Basin]. The British did not want these settlements to revert to a "primitive condition". One major problem was the administering of the oath of fealty, to the British King. The Acadians refused to take the oath, unless a clause was added stating that they did not have to bear arms against the French. Even though they had been away from France long enough to not have any great feeling of fidelity toward the French King, they did share a common language, culture and religion with the French of Canada. The British finally allowed them to sign such an oath in 1730 and they were then known as the 'French Neutrals'. "They were an honest, hard-working, sober and virtuous people", wrote Captain Brooke Watson, an English officer who took part in the embarkation of the Acadians for exile in 1755, "rarely did quarrels arise among them. In Summer, the men were continually at work on their farms; in Winter, they were engaged in cutting wood for their fuel and fences, and in hunting. "The women spent their time carding, spinning and weaving wool, flax and hemp which this country furnishes in plenty. These articles, with the fur of bear, beaver, fox, otter and marten provided them not only with comfortable, but often with tasteful garments. "They also procured for them, other necessary or useful objects by means of exchange-trade they carried on with the French (of Louisbourg) and the English (of Boston). There were few houses without a cask of French wine. They had no other dyes than black and green; but to obtain red, of which they were remarkably fond, they got English red stuffs which they cut-up, ravelled out, carded, spun and wove into strips, to adorn the women's dresses. Their country was so rich in provisions that, as I have heard, an ox could be bought for fifty shillings, a sheep for five, and a bushel of wheat for eighteen pence. Young men were not encouraged to marry, unless the young girl could weave a piece of cloth, and the young men able to build a pair of wheels. These accomplishments were deemed essential for their marriage settlement, and they hardly needed anything else, for every time there was a wedding, the whole village contributed to set up the newly-married couple. They built a house for them, and cleared enough land for their immediate needs; they gave them livestock and poultry; and nature, seconded by their own labour, soon put them in a position to help others. "I never heard of marital infidelity among them. Their long cold winters were spent in the pleasures of joyous hospitality. As they had plenty of firewood, their houses were always comfortable. Rustic songs and dancing were their principal amusement." Early Acadia 1635-1755; Painting by Claude Picard, Saint-Basile, N.B. On January 26, 1734 Jean-Baptiste Sire married Marguerite Cormier (February 18, 1718 - 1792) at Beaubassin. She was the daughter of Pierre Cormier and Catherine LeBlanc of Grand Pré. Catherine was the sister of Rene LeBlanc who was the Notary Public immortalized in Longfellow's 'Evangeline'. For a while they lived in peace, which was all the Acadians wanted... to be left alone by both the French and the British. Jean-Baptiste and Marguerite had a total of of nine sons and possibly one (or two) daughters, between the years 1734 and 1759. During the 1740's there was more haggling by the British and the French over territory and, once again, the Acadians were caught in the middle. There was a small river on the Isthmus of Chignecto called Messaquash which was considered the border between Acadia and French Canada. In May 1750, British Major Charles Lawrence arrived at the head of Chignecto Bay to find the Acadian village of Beaubassin in flames. Father LeLoutre, a Priest turned warrior, and a band of Micmac Indians burned homes, barns, and the church in order to force the Acadians to move to French territory. Lawrence came back later in the year and built a small fort on the east side of the river in Beaubassin. In 1751, the French countered by building Fort Beauséjour on the west side of the river. Whether Jean-Baptiste was recruited to fight at Fort-Beauséjour when it was attacked by Major Lawrence in 1755, is not definitely known. Regardless, the French soldiers were few and poorly led so that they held out against the British for only about two weeks, and then surrendered. The Acadians who had been compelled to help the French soldiers, were pardoned. At this point, the whereabouts of Jean-Baptiste and his family in the following years gets murky. There are indications that some may have spent some time in the Kamouraska, Quebec area. Jean-Baptiste and his family were living in French territory when the dispersion of the Acadians occurred in 1755. Lawrence, Governor of Nova Scotia, hated the Acadians because they were French and Catholic. He was determined to get rid of them (in 1746 there were approximately 12,000 Acadians in Nova Scotia) but he could not get the approval of the authorities to do this so, finally in 1755, he acted on his own. He had made life difficult enough for the Acadians so that many of them had left on their own to re-settle in Prince Edward Island, Cape Breton and New Brunswick. But most of them did not want to leave the homesteads they had worked on for generations. 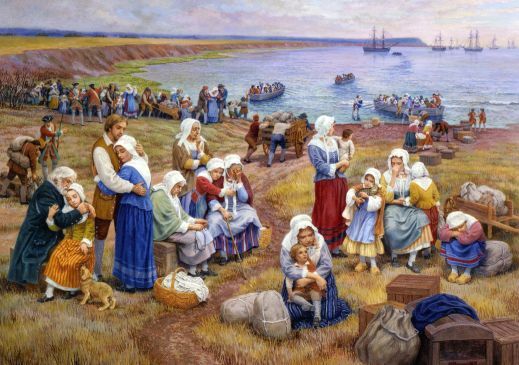 Various credible sources state that between 6,000 and 7,000 Acadians were loaded onto ships, separating families, taking only what they could carry, and depositing them all along the Eastern seaboard of the American colonies. Claude Picard's Painting entitled "Ships Take Acadians Into Exile"
The story of the "Grand Dérangement" can be read in many history books, such as Charles Mahaffie's 'A Land of Discord Always'. In 1763, the Seven Years War between France and England ended with the defeat of the French at Quebec. Now all the territories of formerly French Canada, were under British rule. We next hear of the Jean-Baptiste family as living at Ste. Anne-du-Pays-Bas (St. Anne of the Lowlands) near present-day Fredericton, New Brunswick. From an official document of 1783, we know they had been living there for 15 or 16 years. Thus that would have made their arrival in 1767-68. Jean-Baptiste had a nickname "Crock" (or Croc) and there are various stories as to how he acquired this sobriquet. One is that he was angry at the British for having taken his lands, as result of which he would say... "Les Anglais, je vas les croquers!" This can be loosely translated as "Those English. I will crush them!" Henceforth, he was known as "le croque" which was anglicized to "un Crock"... meaning that he was descendant of Jean-Baptiste Cyr. Another possible source of the nickname "Crock" is taken from the 'Revue de la Société Historique du Madawaska, April 1989"
"... we know meanwhile that Jean-Baptiste [Crock] Cyr, ancestor of the Cyrs of Madawaska, was working a maple syrup operation in the region of the lowlands, before the arrival of the Loyalists in 1783. The Reverend D. J. LeBlanc, pastor of Kingsclear Central, wrote to P.L. Mercure on October 30, 1900. Traditions tell us something quite interesting as to the origin of the nickname "Croc". The old Jean-Baptiste had tapped the maples of the region, to load up a ship that was going to France... nevertheless, our Acadians rejoiced in 'thinking' in French: 'Won't they have something to crunch'. They were far from thinking that the nickname would endure. [Extracts from P.L. Mercure's papers, translated to French]. Consideration must be given that Jean-Baptiste, at one point, settled across the River Ecoupag at Crock's Point, where he may have inherited the nickname, "Crock". They had no sooner built their homes and cleared their lands when the British once again coveted their lands. After the American Revolution, many Loyalists from the colonies who wished to remain under British rule, migrated to Canada. The authorities decided to once again dispossess the French of their lands and gave them to the Loyalists. That is probably why the list of settlers of 1783, was drawn up. In 1784, Jean-Baptiste, his sons and several other families petitioned the government for lands in the Madawaska region. "The undersigned declare that the uncertainty in which they have lived in Acadia, without the assurance of ever becoming owners of the lands they have cleared on the St. John River, have kept them in insurmountable perplexity and they humbly implore you to help them. The new Colonies, which His Majesty establishes on the said river, seem another obstacle which is most serious since they have lost all hope of living peacefully in Acadia. With these considerations, Your Lordship, they have recourse to your kindness hoping that you will act towards them as their Father and Protector. This is why they implore the help and assistance of Your Excellency, and ask that you concede them an establishment in Madawaska, where they intend going as soon as Your Excellency grant their humble request. They pray you to consider also, their poverty and sad circumstances, the distance to the place, the difficulties of getting there with the little they have, a soil unknown to them, the impossibility of drawing profits during the first years of hard labour which must be done to clear their new lands. They hope you will consent, with your usual kindness, to grant them provision for two years in order that they may support themselves and their families which are very large. On the recto of the letter is written: "Memoirs of the Acadians on the St. John River." Jean-Baptiste Cyr and his nine sons were unable to sign their names. Those who have signed this petition are: Alexandre Ayotte, Zacharie Ayotte, Joseph Daigle Sr., Olivier Thibodeau and Louis Sansfaçons. Nothing seems to have come of it for on April 8, 1785 Jean-Baptiste, who had been dispossessed of his land in the Lowlands, petitioned the government for land near the mouth of the Kesewick (Keswick) River. He was again refused. A petition dated June 21, 1785, by some of the settlers asking for land in Madawaska was approved, and they were told two hundred acres would be given to each head of family. A meeting was held at Jean-Baptiste's house and it was decided that half of them would go to the Madawaska region and the rest, to other areas where Frenchman were settled. Unfortunately, Jean-Baptiste did not live to go to Madawaska. He died in May 1785 at age 74, just before the departure of his sons. Just prior to his death, JEAN-BAPTISTE "CROCK" CYR is reported to have walked through his farm one last time. There, bowed with age and discouraged with grief, he is reported to have cried out: "My God! Can it be true that there is no place left on earth for a 'cayen' (Acadian)"? Still, he is known as "THE GRAND PATRIARCH OF THE VALLEY CYRS" and a plaque was dedicated in his honour at the Cyr Family Reunion in 1981. The Madawaska region was a wilderness area farther up the St. John River. Madawaska is an Indian word meaning "land of porcupines". The only inhabitants were about 60 Indian families living near the junction of the Madawaska and St. John Rivers, and a couple of Frenchmen. Their only access was by river, so in June 1785, a group of Acadians, including two of Jean-Baptiste's sons, went upriver in canoe. They portaged around a large waterfall (Grand Falls, New Brunswick... where I [Yvon] was born) and went almost as far as the Indian village. They landed on the south bank of the river near the present-day St. David Church. They paid their respects to the Indian chief and were well received. "Late June 1785 is generally accepted as the time of the founding of Madawaska Settlement. Prudent Mercure has recorded however, a popular Madawaskan tradition to the effect that the families of Paul Cyr, Louis Sansfaçons and Pierre Cyr were the first to arrive in Madawaska from 'Les Pays Bas', in the Fall of 1785 and that they were joined as settlers the following Spring, by the main contingent of families from the Fredericton (New Brunswick) area. This tradition goes on to say that some of these settlers went to St. Andre (Kamouraska) in Canada during the Fall of 1786 to spend the Winter, returning to Madawaska the following Spring (1787), accompanied by a number of French-Canadian families who joined them as settlers in the new colony. Pierre SIRE, notre ancètre commun et le premier du nom (1) en Amérique du Nord, arrive en Acadie vers 1668 et il s'établit à Port-Royale, le seul véritable établissement de l'époque dans cette partie du nouveau monde. Originaire de France [Added note from Yvon, December 2011... we cannot be certain that Pierre was from France and early DNA tests, suggest he may in fact have Flemish roots. Flemish is the territorial name for the Dutch language spoken in historic Flanders, a region mostly comprising the northern part of Belgium, but also including a southern part of the Netherlands and a small area of northern France] ou il est né vers 1644 (2), il pratique le métier d'armurier au service d'une population de quelque 320 personnes. Moins de deux ans après arrivée, il épouse Marie BOURGEOIS, fille de Jacques Bourgeois et de Jeanne Trahan, née a Port-Royale en 1653. Elle est donc la cadette de neuf ans. Par ce mariage, l'ancètre s'allie a l'une des familles les plus prestigieuses de Port-Royale après celle du seigneur Le Borgne de Belle-Isle. Amené de France par d'Aulnay en 1640, Jacques dit Jacob Bourgeois arrive avec sa femme, Jeanne Trahan, et il pratique en Acadie sa profession de 'chirurgien royal'. Il s'occupe aussi de commerce avec les Indiens, laissent entendre des documents d'époque, en plus de diriger une entreprise de cabotage dans la Baie Francaise (Baie de Fundy) et sur la cote Atlantique. Interessé à l'agriculture, il fondera enfin un nouvel établissement qui deviendra plus tard, Beaubassin. Pour en revenir a la famille de Pierre SIRE et de Marie BOURGEOIS, elle s'enrichit des la fin de l'été 1671 par la naissance d'un premier enfant auquel on donnera le prénon de Jean. six brebis; point de terre en labour. Malgré l'insignifiance relative de ses biens, l'aieul compte alors parmi les privelégies de la colonie. Puis le jeune ménage dcide de suivre Jacques Bourgeois qui entreprend de developper 'la colonie Bourgeois'. Appelée à prendre de l'envergure, celle-ci deviendra plus tard la nouvelle paroisse de Beaubassis. Le nouvel établissement se situe tout au fond de la Baie Française, a peu de distance de l'actuelle frontière séparant le Nouveau-Brunswick de la Nouvelle-Ecosse. Les premières habitations se dresent sur une élevation longeant la rive sud de la petite rivière Missagoueche. Les indiens de la région désignent l'endroit sous le nom de Chihnectou (4). Très tôt, la nouvelle colonies enrichit d'un moulin a farine et d'une scierie dont l'outillage usagé provient de Boston et a été déménagé en pièces détachées. En 1676, la premièe famille CYR du continent accueille un deuxieme fils qui répondra au prénom de Pierre, comme son père. Cette naissance-la n'est pas enregistrée a Port Royale, comme la précédente, mais a Beaubassin. Trois ans plus tard, on voit naître un troisième fils prénommé Guillaume. Pierre Sire ne va pas survivre longtemps a la création de Beaubassin. Il se peut d'ailleurs que Guillaume soit un fils posthume. En effet, Pierre meurt très vraisemblement vers 1679, a peu près au moment de la naissance de Guillaume. Pas de trace du décès aux régistres d'état civil. On sait cependant qu'il se situe quelque part entre la conception de Guillaume et le remariage de sa veuve, le 9 juin 1680. Elle épouse Germain Girouard (Girouer, à l'époque), fils de Francois Girouard et de Jeanne Aucoin. Bien sur, Marie garde avec elle les trois enfants qu'elle a eus de son premier mariage. Elle en aura au moins deux autres de son deuxieme mari: Germain junior, né en 1681, et Agnès en 1685. Selons les données d'un récensement dressé en 1686 (5), Beaubassin compte alors 129 habitants repartis en 16 ménages àl'exclusion de celui du siegneur Michel Leneuf de la Vallière. Ce n'est pas encore la grande ville! Veuve de nouveau en 1693, Marie Bourgeois finira ses jours hébergée par son fils cadet du premier mariage, Guillaume. Un nouveau recensement dressé en 1714 inscrit en effet, le nom de la veuve avec la famille de ce dernier. Marie Bourgeois meurt finallement a Beaubassin le 2 mars 1741. Ce qui lui donne l'âge respectable de 88 ans. Je ne sais pas si c'est elle qui donne le ton mais, comme on pourra le constater par le tableau génélogique qui occupe la plus grande parti de cette ouvrage, il se trouve que très souvent on meurt vieux dans la famille. Voila! C'est tout ce qu'on sait de l'ancètre Pierre. Peu de choses a la vérité. On ne sait surtout pas de quelle région ni de quelle province de France il était originaire. Encore moins de quelle paroisse en particulier. Certains, tels l'abbé Leon Auger, en font un fils de Fontenay-le-Compte. D'autres le font naître a Saint-Germain-de-Bourgueuil. Il s'en trouve même pour en faire le déscendants d'un émigrant russe établi en Bretagne! Ni les uns ni les autres n'ont jamais réussi dependant a produire la moindre preuve a l'appui de leurs affirmations. Or, tant que je n'aurai pas un bout de papier en main, certificat de naissance, contract d'engagement ou quoi que ce soit, je préfère dire que je ne sais pas. Il y a une autre petite chose que l'on sait: l'ancètre Pierre savait écrire. Et contrairement a ce qu'on avait cru jusqu'ici, il ne signait pas SIRE, une déformation due aux auteurs des récensements et aux curés. Il signait avec deux "R", soit "Sirre" dans le patronyme. Le seul document qu'on ait trouvé portant sa signature est une espèce de procès-verbal d'un assemblée des habitants de Port-Royale tenue de dix-huit juin mille six cent soixante-dix (1670). La rencontre portait sur la construction d'une église paroissiale, sur l'adoption d'un standard de poids et mésures et sur la protection des propriétés privées contre les dommages causés par les bestiaux. On y relève les noms de trente-cinq personnes, dont six seulement ont su signer. On ne parle pas ici de n'importe quelle signature. Pour montrer quon savait écrire, il fallait y aller de fions et fioritures. Ce qui explique la curieuse initiale "P" du prenom de l'ancètre. (1) Deux autres souches de Sire vont arriver par la suite. D'abord, Andre SIRE, originaire de Fontenay-le-Compte, en Vendée, arrive a Saint-Ours-sur-Richelieu en 1673; il s'établira plus tard dans l'ile Jesus. Ensuite il y aura LOUIS SIRE, originaire de Saint-Eloi de Dunkerque, en Bretagne, établi a Grand Pré en 1680. (2) Il se donne 27 ans au recensement de 1671. (3) Archives nationales de France, recensements. (4) Un monument rappelant le site du Fort Lawrence, en Nouvelle Ecosse, est érigé à l'endroit précis ou s'élevait l'église de Beaubassin. Incendie par les Anglais en 1750, cinq ans avant le Grand Dérangement, le village de Beaubassin n'a jamais été reconstruit. (5) Les données de recensement ont paru en annexe à l'ouvrage de Rameau de Saint Pierre: 'Un colonie féodale en Amerique', Page 401 du tome II. (6) Copie de ce document est conservé dans les papiers Leneuf, aux archives nationales du Canada. Copy of document at Ottawa National Archives (as provided by Michael J. Lewis). Pierre Sirre Acadia and Andre Syre Quebec are not related in any way. But he also drew heavily on people from the north like Perche and at least 20 from the south Toulouse regions. Bourgeil was searched by their archivist and there is not a single Sire family in the region: my research repeats these findings. His signature as Sirre: leaves little doubt to his heritage. Hope you are enjoying this as much as we are: this hunt! We won't stop until we find him! The earliest Le Syre family in Poitou seems to be around the year 1125 with Gillemi Le Syre: who clearly was a Catalan: Spanish.............and the Le Syre a clear reference to Saint Syre as they wrote it quite often. And the last French ships to Canada before the expulsion were mainly from Dieppe.........during the years Pierre would likely have come over. only one place on earth that all lined up and that was in Rouen region. Looking again: I finally got it! He can be everything we know about him... if he comes from this family. ..........of a similar age...........who drops off their ancestral charts: outcome unknown. But the finish line is getting closer! In an effort to "write the final chapter" on the origin of our first ancestor Pierre and at the suggestion of Suzanne Sears, I have today decided to have my personal DNA tested so as to, once and for all, determine the origin of Pierre Sire! For those Cyr-Sears-Sire individuals who might consider DNA testing, the process is relatively simple. I personally requested my DNA kit from Family Tree DNA which will be provided at a "group discount" rate. Won't you 'partner' with Suzanne and I to help us write Pierre Sire's final chapter by having your own Cyr-Sears DNA tested? You can get all the pertinent information, by connecting to World Families Net. Just so you know, I personally chose the Y-DNA67 male-specific test since it includes the most markers. My results will identify the ethnic and geographic origin of the paternal line. It includes a balanced panel of sixty-seven Y-chromosome Short Tandem Repeat, STR, markers. The additional markers refine the predicted time period in which two individuals are related and eliminate unrelated matches. A perfect match at sixty-seven markers indicates a common ancestor in very recent times. This is the ideal test for matching if a break in the paper trail, such as an adoption, is known or suspected. A haplogroup is determined and backed by the Family Tree SNP Assurance Program. When another person shows identical results within the database, if both parties have signed the Family Tree DNA Release Form, then Family Tree will inform them of the match. The customer will also receive a certificate and report describing the testing process and the meaning of sixty-seven marker matches. I was given your email to help clear up the whole Andre/Pierre stuff. I am a direct descendant of Andre's via his son, Michel, and have been working like crazy with Suzanne to find the link between our two clans as well as the other Sire clans of the world. When comparing my father's DNA to her father's (an Andre vs a Pierre), we find there is a genetic difference of 2 (or common ancestor back in about the 1400's). I am also having my dad undergo other tests to help answer questions such as where we were from before France and to help link us to our original celtic tribe. If you have any questions about what we've found/done so far don't hesitate to contact Suzanne or I, and anything I can help with on the Andre things I'd be more than glad to. "Parcourant votre histoire de l'origine des Cyr, je me dois de vous raconter ma découverte d 'un petit village de Bourgogne nommé Thury et situé près d'Auxerre en gros trois cents habitants . Jusqu,à là pas de quoi fantasmer . Invité à passer Pâques en 1994 par une amie du nom de Marie-madeleine Benoit j'ai eu la très grande surprise que ce village était habité en majoruté par des Comeau, des Sire, des Benoits, des Bourgeois et des Roy. Simple coincidence ou véritable village d'origine de nos familles ? Je me suis souvent poser la question et me la pose encore."